The majority of supporters (85%) supported the abolition of MMP and the return of First Past the Post, so it has become 5PM policy. PROPOSAL: Should MMP be abolished and replaced with First Past the Post? 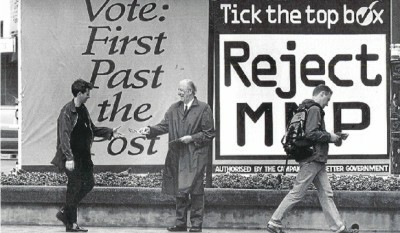 When MMP was introduced as a consequence of the referendum in 1993, the public felt the result would be better governance and the abolition of the Maori seats. Instead, there has been a track record of government compromise and minority rule, as well as more Maori seats! MMP is failing to deliver good governance as minor parties hold the balance of power, leading to accusations that the tail is wagging the dog. All MPs in Parliament should be elected by voters, not appointed by party bosses. First Past the Post delivered two-party rule, not democracy at all. Under MMP all voters are better represented in Parliament. There is more diversity, and the minor parties deal with issues that would otherwise be ignored.